Did you hear about our Rafffle? Haha. The funniest thing is that up until a year ago, I didn’t get that reference. And to be completely honest, I ended up hating the movie, but I kept it on whilst doing projects just so I could see the “Beuller” part and feel like one of the cool kids. I’ve been waiting for a chance to fit in like this. Too bad I didn’t think to just look the clip up on Youtube. Life’s tough lessons ya know. Anyeeway… the odds are very much in your favor for the Raffle! I’ll just say that we’ve had many very generous donations, but no one wants to put their names in for the Raffle prizes!!! For goodness-sake, people! I wanted to make this rewarding so that WE can give to YOU too!!! And actually, they were mostly all donated-prizes, so it’s really more like we’re re-gifting. As of right now, there are 5 tickets that have been put in for the ipad… and your chances are about the same for everything else. Just sayin’ – those are some pretty good chances. 1 month until the drawing! The drawing will be held at the end of the benefit dinner we are having on June 27 at Peace Church (6950 Cherry Valley Road, Middleville, MI 49333) from 5:00-6:30 pm. Also, if you are big into garage sale-ing or baked goods, we (ok, I) will be at 754 Washington Blvd, Lake Odessa, MI 48849 from 9:00-4:00 on June 4-6. I made 3 different types of cookies this weekend and froze the dough to bake up for the sale. One of the cookies that everyone always seems to love is cinnamon-chip snickerdoodles. The only problem is that finding the cinnamon chips is like searching for truffles (the mushroom, just to be clear). When I came home empty-handed from my truffle-hunt this weekend, I went on Amazon and discovered that I could order 6 bags for $16 including shipping. Not bad at all. Only… there were 12 bags, not 6. I decided to share my shopping-sins and piled them in one huge pile on the kitchen table. His reaction surprised me. I thought hoped he might be amused when he got home, but wasn’t prepared for him to think I was THAT funny for ordering 12 bags of cinnamon chips. As it turned out, HE’s the one that ordered the exact same box of 6 from Amazon to surprise me! I’m not exactly sure how to feel about this: amused, grateful, blessed, or a little creeped-out. 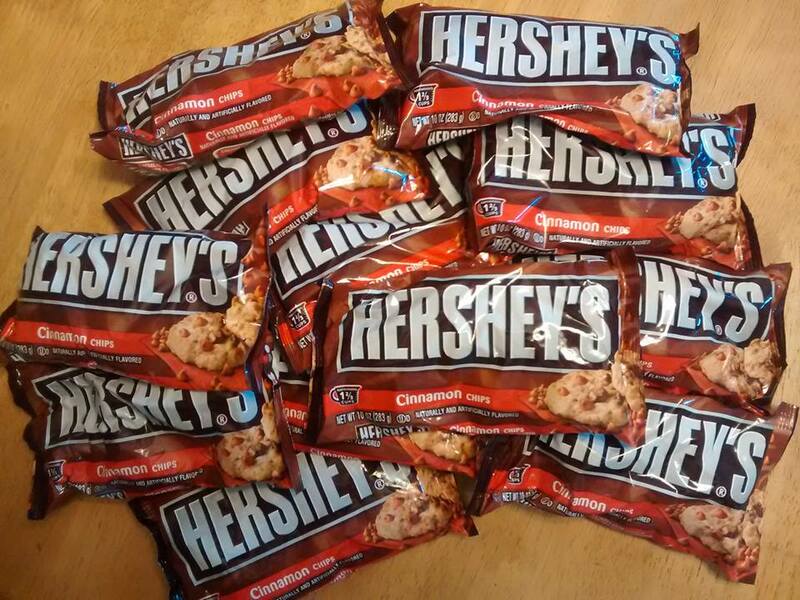 This entry was posted in Fundraising and tagged Adoption Fundraising, Love, Sweets. Bookmark the permalink.